In America casino gambling was illegal except for in Louisiana and in the Wild West. 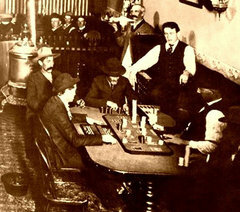 Despite this, gambling was still widespread in the Eastern states, and in the Wild West gambling popularity boomed under the feverish free-for-all of the gold rush. Much of the gambling at the time took place around mining camps and on riverboats. Riverboats were full of cardsharps who worked together with the captains of the boats to lure wealthy travellers aboards and divide the spoils. 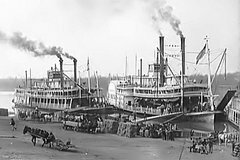 When gold was discovered in the West and buoyant spirits led to many more opportunities for gamblers to relieve the heedless of their newly discovered wealth, this naturally caused many of the riverboats to head on down the Mississippi river in the same direction. There was no working basic strategy or methods of counting cards at the time. Therefore people who could make a living gambling professionally were not card counters, they were very talented cheats and sleight-of-hand artist. Gambling licences did exist in the early 20th century, but these were no guarantee that your game was fair. It merely meant that the government collected a cut of the profit via taxes. The game of vingt-et-un, or twenty-one came to America in the 18th century, soon after it was introduced in France. The gold rush likely brought Vingt-et-Un to the Wild West, though there is no definite source on how and when exactly the game found its way across the Atlantic. In the colonies on the East Coast gambling was illegal but thriving, and Vingt-et-Un could have been imported by any adventurous Frenchman or European afficionado. In the West, however, gold prospects were a great lure to all and any, and the gambling prospects that this resulted in were a great lure to many gambling syndicates and entrepreneurs from France. 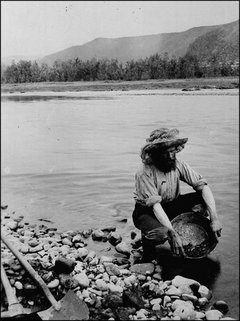 In California miners did strike gold, in the Empire mine, and lots of it. And in the town Nevada City that sprang up because of this, in California near the border of the State Nevada, the most famous 21 pro in the Wild West began to make a name for herself. That’s right, herself. The most famous twenty-one dealer of the Wild West was a woman. 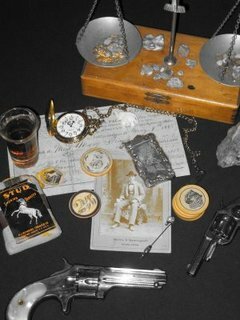 When gold was struck in the Empire mine by Nevada City in California this attracted many prospecting agents, miners, entrepreneurs, and of course gamblers. One of these was the petite Frenchwoman Eleanor Dumont. Within weeks of arriving, the stylish Dumont opened an establishment called the Vingt-et-Un, named after her game of preference. It’s not quite clear if she was a card-sharp or just benefitted handsomely from the house edge. She was renowned for the “honest game” she played, although this may also have been a reference not so much to how she played but to the fact, attested by a number of sources, that she always payed out fairly and always paid off any debts she incurred. She set up Dumont’s Palace, a much larger establishment, and bought a farm to settle down in, but eventually fell on hard times when she married a crook who took off with her money. She spent the rest of her life on the road, with a pack of cards and a pistol, travelling from city to city, trying to chase down her worthless husband. She never succeeded in finding him and ended her own life with an overdose of morphine in Bodie, California. Whether legal in the different American states or not, gambling was completely unregulated. Where illegal, large casinos could still exist, as long as they made enough profits to pay off the local law enforcement, such as in Saratoga Springs, New York state, where some of the most prominent citizens, businessmen and government officials, were casino patrons. The occasional raid was made to appease the moral crusaders, and the necessary bribes were made to appease the law enforcers. It was also in America that the rules changed to include the dealer’s face-up card and compulsory dealer strategy to stand on 17 and over. The game of blackjack really took off during World War I. The current name, Blackjack, most likely developed around that time as a consequence of a rule that is no longer part of the game today. A sort of stakes stunt professionals would often use to attract players and tempt them to make more hefty wagers was to offer bonus payouts for certain hands. The most common bonus was for a natural that included the jack of spades or clubs. The name stuck, and today a blackjack simply refers to any natural, regardless of what ten-value card that hand includes. From here on we move into the modern era of blackjack, with the emergence of basic strategy and card counting techniques. To read more about the modern history of blackjack from the 1950s onward, move on to our modern history of blackjack section, or navigate back to our blackjack history page for the full overview of the different history sections.